Organic pollutants are harmful to the ecological environment and human health. 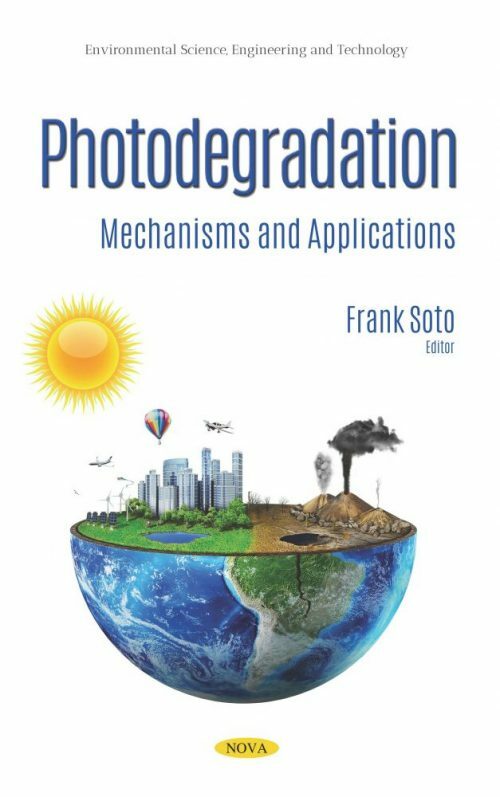 In Photodegradation: Mechanisms and Applications, the authors propose photodegradation as an attractive strategy to remove organic pollutants. Photodegradation only requires suitable photocatalysts and light, and the sun is an inexhaustible light source. Next, the authors investigate the importance of the photochemical process on the fate of profoxydim in water, determining kinetic parameters in aqueous media and detecting photoproducts formed. To obtain more information, a phytotoxicity bioassay study of the photodegraded herbicide on plant growth is performed. The photodegradation mechanism of cyanine dyes is examined, as a concise understanding of the photodegradation mechanism of cyanine dyes will result in the proper application of the photodegradation mechanism. Future prospects for the application of the multiphoton photodegradation of cyanine dyes are described. Also discussed is cyanocobalamin or vitamin B12, a component of vitamin B complex that acts as an essential biological co-factor. It plays a vital role in the metabolism of amino acids, fatty acids, hormones and numerous other biological compounds. Vitamin B12 group is chemically known as cobalamins which consist of cyanocobalamin, aquocobalamin, 5-deoxyadenosyl cobalamin and methylcobalamin. As a representative two-dimensional layer-structured transition metal dichalcogenide, tungsten disulfide has gained intensive attention due to its unique optical and electrochemical properties. Thus, one chapter explores WS2 as a photocatalyst for the degradation of organic pollutants, with emphasis on its role in nanocomposites and the mechanism of photocatalysis by WS2 with respect to its bandgap energy and structural features. The concluding review examines the experience in photochemical studies of organic substrates; namely photodegradation of water contaminants and humic acids of a different nature. The influence of VUV and UV radiation on the photodegradation of organic compounds is investigated using electronic absorption and fluorescence spectrometry and chromatography methods.